By default, content approval in SharePoint is turned off and (usually) any user with Read access can see Draft items in most apps. Sharepoint sites created with the publishing site template, however, already have content approval turned on in the Pages app. Navigate to your app’s Settings Page (Library Settings or List Settings) and click the Versioning Settings link. The Versioning Settings page appears. Select the Yes radio button below Require Content Approval for Submitted Items. You see options to retain versions, specify who can see drafts, and in library-based apps — document check-out options. Notice that the options below Who Should See Draft Items in This Document Library become available as soon as you select the Yes radio button to require content approval for submitted items. You need to decide whether readers, editors, or only authors and approvers can see drafts. 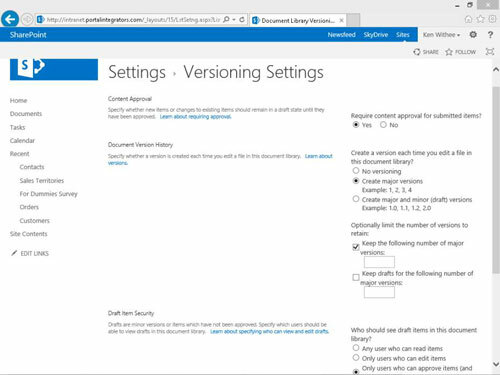 Verify the Document Version History settings in the Document Version History section. You can specify versions without turning on content approval. A major version is created when you publish a document and a minor version is created when you save a document in SharePoint. You can configure which level of detail you want to set in versioning by choosing None, Major, or Major and Minor. Click a Draft Item Security option in the Draft Item Security section. The security referred to by draft item security — Read, Edit, and Approve — maps to SharePoint’s Visitors, Members, and Approvers groups. Click a check-out option in the Require Check Out section. You return to the Library or List Settings page from whence you came. The items created in (or changed in) the SharePoint app are subject to approval (unless you disable content approval later). If content approval is active in SharePoint, when users add an item to the app, they see a note that items require content approval in the item properties window. After the item is added, it appears in Pending status in the app view until it is approved.